Job 33:14...For God speaks time and again, but a person may not notice it. I look forward to my mornings because this is when I read my devotions, do my Bible study, and sit quietly with God and pray. It feels so good as I sit taking in my Savior. I make notes and write down various verses to read and remember throughout my day. I think of ways that I can serve Him that day and make mental notes to do certain things. Then my family wakes up. Let the busy morning begin. I have three kids that need to be at three different schools. My oldest drives himself, but I am still up making sure he gets off safely and on time. Though my heart desires to keep God in front of me all day, there are days that leave me wishing I had more time to complete certain tasks that have to get done. 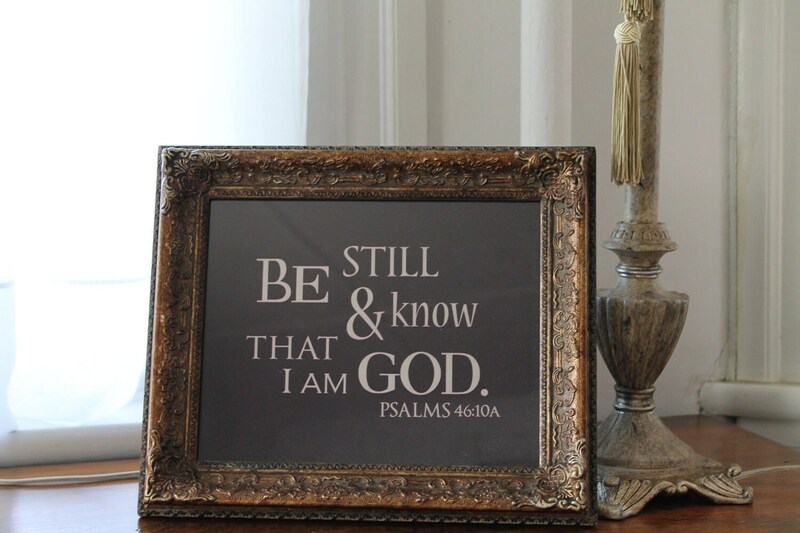 I find myself so busy that I forgot to look at the verses I wrote down or take time to be still and know that He is with me. A friend recently shared something with me that has rocked my world. I mean the goose bumps haven't left my body yet. I am still trying to catch my breath. It left me in awe of the great love Jesus has for His children. Her family is dealing with something that has dropped them to their knees in prayer and socked them in the gut. Let me say, this woman has a powerful story of redemption and she loves the Lord with everything she has. She is not ashamed of the Gospel! She knows, I mean really KNOWS, her Jesus. As the issue that her family is walking through was just beginning, Jesus gave her a clear, unmistakable vision of what was going to happen. As she relayed this to me she said something that I don't think I will ever forget. She said, "God doesn't ambush His children." Isn't that beautiful and comforting? We serve a God who loves us beyond what we can even comprehend. He loves my friend so deeply that He gave her a vision. Guess what? The events that are now happening are leading straight to what she saw in her vision. Doesn't that cause your heart to stir with great awe for our Father? As I reflected on this, I realized He speaks to all of us in many ways. Sometimes we are afforded a vision, other times a specific Bible verse will take our breath away. My sweet friend was able to receive God's vision because she was still before the Lord. Her heart is hurting for her loved ones, but she has a peace and a love for her Father that cannot, and will not, be shaken. I wonder, how many times have I missed God's still, small voice? How many times has He wanted to tell me something but I was just too busy to listen? I am so very blessed that my friend trusted me enough to share her experience with me. May I not just hear it, be moved for a couple of days, and then resume my busyness. God desires to show us His love. Let's be quiet long enough to hear His precious words.